From Rucker Park to the Goodman League to basically any blacktop in between, if there's a hoop and a round-looking ball that bounces, Kevin Durant wants to play. A couple years ago, Durant showed up in Orlando, Florida, where his young teammates were playing in summer league, ready to play. Management told him no, and Durant was forced to just watch. But maybe for the first time ever, Durant has turned down the opportunity to play basketball. In a statement on Thursday, Durant pulled out of the 2014 FIBA World Cup, citing mental and physical fatigue. 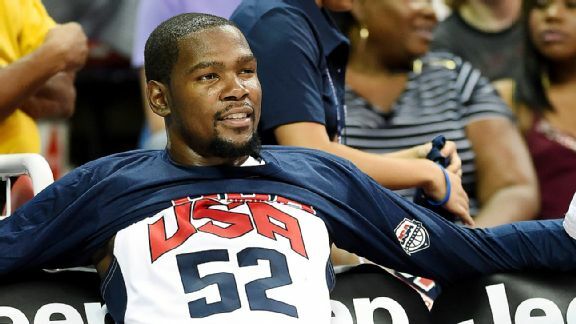 "After going through training camp with USAB, I realized I could not fulfill my responsibilities to the team from both a time and energy standpoint," Durant said in a statement. "I need to take a step back and take some time away, both mentally and physically in order to prepare for the upcoming NBA season." The only other time Durant has ever really admitted to being tired was when he said he was tired of being second. Other than that, he's almost taken offense to being asked about fatigue. He said during the 2012 NBA Finals that he could "shoot 'til my arms fall off." He said in the lockout year, seriously, that he could play two games in a day if needed when asked about playing back-to-back-to-backs. When he came up short on a game-tying 3 against the San Antonio Spurs in Game 6 in an overtime in which he went scoreless, Durant wasn't having any of heavy legs being the reason. Every time Oklahoma City Thunder coach Scott Brooks tries to sit Durant for brief rest, he readies himself for an argument. Still, time off for an NBA player is precious, and Durant was quickly realizing what he had committed himself to. Coming off a season in which he carried the Thunder with teammate Russell Westbrook out for almost half of it, combined with yet another deep, draining playoff run, he essentially wasn't going to have any time to himself. From one thing to the next, Durant was going to play in the World Cup and then head to training camp just a couple of weeks later. Durant made his commitment to the World Cup a full year ago, doing it with Kevin Love at a Team USA minicamp in Las Vegas. He wanted to follow through on that commitment, but after spending a week with the team, he quickly realized it felt like more of a chore than anything else. Then, Paul George broke his leg right in front of Durant. Add in that he's about to be a sneaker free agent, with his seven-year deal with Nike about to expire, and the guy has a lot on his mind. Since the 2010-11 season, no player has played more minutes than the nearly 15,000 Durant has logged on the floor between the regular season and playoffs. He played in the 2010 World Championships in Turkey (winning MVP), then again for USA Basketball in 2012 at the London Olympics. He's played until at least May the past five NBA seasons and hasn't missed more than eight games in any season. He's a basketball machine programmed to play. The Thunder's 2013-14 season was a wild roller-coaster of emotions with Westbrook's injury, four-point plays, overtimes aplenty, emotional speeches, Serge Ibaka's injury and on. The mileage Durant tacked on wasn't just about the raw number of minutes. It was about the complete investment of body and soul. The price of all that adds up, even for someone as durable and relentless as Durant. Mentally more than anything, the haul of doing your job 270-plus days straight is a draining, almost inhuman experience. "If you're on the outside looking in, of course maybe it looks easy because you only see us on the court playing the games," he said. "But you don't see the second after the game is over with the things we do to prepare for the next game. The emotional and physical toll it takes on you when you go home at night, the practices you go through to get prepared, the travel, taking time away from your family to play a game you love to try and win a championship. Guys on the outside don't see that." And he was all set to give up almost two months of the only respite he'll get before it starts all over again. Can you blame him? Durant's decision to withdraw from the World Cup isn't about one thing. It isn't just about the lingering fear from George's horrific injury. It isn't just about Nike and Under Armour dueling for his signature. It isn't just about the minutes that add up and hang on your legs like toddlers in May and June. It's about the price that comes with playing and the potential benefits of not. Durant has never really said no to basketball. The game has always been in charge, always made decisions for him. And maybe, for the first time, he's putting his own body and mind ahead of it.